It is not uncommon for us to see what looks like a brand-new Austrian boot with a completely worn-out sole. The Austrians, like the Germans, have a tendency to overbuild everything — and the paratrooper boots are no exception. All "Resole Special" boots have uppers which are identical to our normal "Grade 1" Austrian boots. The only difference is that their soles have worn to the point that we recommend replacement. Thankfully, the Austrians anticipated this in their design, and resoling is an easy job for any competent cobbler. Now there are a lot of soles that will do the job, but we personally recommend the #132 Vibram Montagna. Compared to the original Austrian sole, the #132 features deeper lugs and a slightly tougher rubber. The result is something that is incredibly hard wearing. So much so that it is the preferred sole of Minnesota's motorcycle police, who regularly abuse the ever-loving-heck out of it. If you have a local cobbler you like, that's fine and dandy. Vibram is a big brand, and almost every shoe repair shop can get the #132. However, if you're short on time or don't have anyone near you that's okay too. Inside every order we will be including instructions for a mail-in resoling service provided by myshoehospital.com. We've partnered with them to offer an exclusive discount on resoling the Austrian boots, and we are pleased to say they do a fantastic job at it. We've sent several pairs through their process and have been consistently impressed with the results. Your boots may or may not arrive with insoles. If they do, they will likely be worn and old. You should consider replacing them before breaking your boots in or wearing them more than casually. 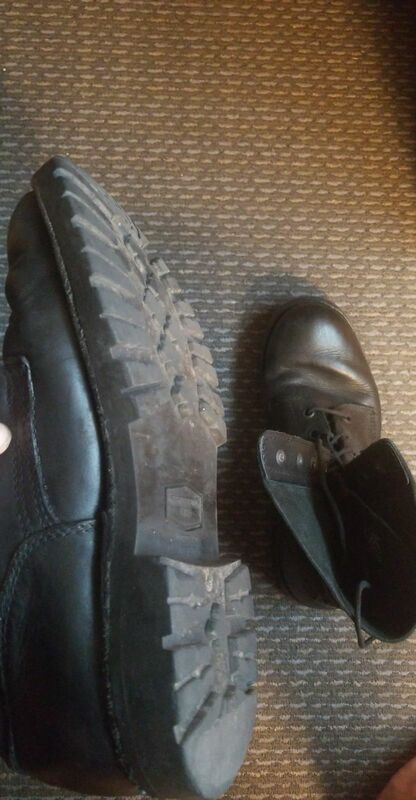 Generally, these Austrian paratrooper boots have already seen some use. This does mean that the leather is not as stiff as new boots, but a breaking-in period is still recommended. To break in your boots, wear them as often as possible over a one-to-two-week period of regular activity (think grocery store trips, not hiking trips or guerrilla warfare). Use good, full-length wool socks, and take note if you feel any "hot spots" while walking around. Friction between your foot and the boot causes blisters. Breaking in your boots should help with this. If hot spots persist, silk or synthetic "liner socks" (worn under your wool ones) are a cheap and easy way to protect your feet. They are freely available at most outdoors stores. It is of Ivan's opinion that tying your boots with a speed lacing method is superior to that of any external bow or knot. It not only looks cleaner, but also minimizes the chance that you will trip, get your boots stuck, or have them untie because you used a granny knot like a child. There is an assortment of different speed lacing methods that will have these three attributes in common. If you are not going to tuck in your trousers when you tie your boots and you are wearing baggy pants, we recommend investing in elastic blousing garters / "boot bands." It will look cleaner and keep your trouser cuffs out of the way. 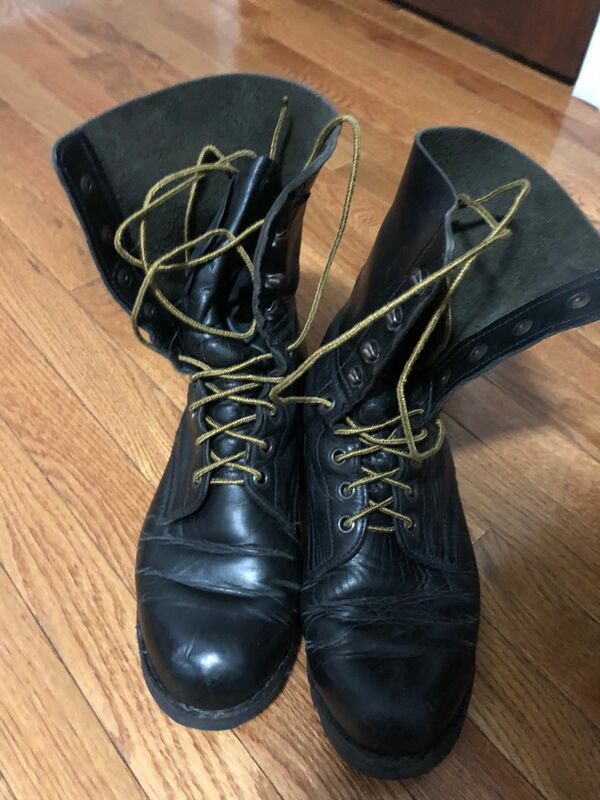 Basic repair and maintenance for leather boots is cheap and easy. We've created a photo guide of the bare-bones basics on our blog. The goal of this guide is to introduce every step you need to get Austrian boots up and running and keep them that way. No fancy tricks or boring conjecture. All with a low budget approach with minimal supplies! We've consolidated everything into four steps. Follow all steps relevant to your boots in chronological order. All steps are hyperlinked. Simply click on a step to be directed to the guide. Walk into any store that sells shoes and ask to have BOTH your feet measured. If you find one foot is wider than the other, get that size and force the habit of leaning on the smaller foot when standing still. If you plan to wear your boots with a thick insole and medium/thick socks, buy one size bigger. For those with wide feet, you should follow your general style of fitting into normal shoes. For reference, a size 10.5 EE wide foot fits best in a size 12 shoe with an arch based insert. Flat feet or not, it is important to have an insert with a raised arch. The knuckles of your foot widen under your own weight. Displacing weight off that part of your foot will make it more comfortable. The break-in period may be a little uncomfortable at first for wide feet, but the sides should stretch in time. If they do not improve after a month, reach out to us for a possible exchange. Shoe sizing over the internet can be a little more finicky than clothing. If you are unhappy with your boot's size and would like to exchange for a different size, ship it back to us, and we will pay for shipping the first replacement back to you. For obvious reasons, we will not accept returns for worn or damaged soles on this product. As stated above, the “Resole Special” boots are in overall good condition except for the soles which will need to be replaced. Any scratches, scuffing, or dirt is superficial and will clean up nicely with regular use and by following our boot care guide above. On rare occasions boots will have hole-punched tongues, and sometimes grommets high on the inside of the ankle. These should not cause any functional or aesthetic problems when wearing the boot. The hole punch on the tongue is high up by the tag and not visible when the boot is laced. The ankle grommets are at the same height and allow you to tie the boots together for storage or drying. Haven't had to break these in very much, can wear these without socks, they feel great and very lightweight. Also the soles are in much better shape than expected. Was a bit apprehensive at first about buying stuff here. Boot fits well, feels nice, and I like the look a lot. Description says to replace the insole and that's a must. There's some expected scuffs that are nothing drastic. 5 stars cause you get exactly what you're told in much helpful detail for a nice price with a quite speedy delivery (US). Since join duty faction I need extra spicy boots for to be running. These come at price of small potato bag, but cannot be torn down, unlike cheap Berlin wall. Weird how Australians make good combat boot, since they lost emu war. -Follow cleaning/sealing instructions provided on KS. They have seen some use, but it’s easy to make them at the very least serviceable if not pleasant looking. -Like many others, mine came with at least another year of tread left. No resole needed upon delivery. -I bought cheap/rugged insoles off popular jungle river sounding (((merchant’s market))). You don’t need anything fancy; Boot is Fine. -I’ve used them for some light hiking and everyday wear thus far. Zero issues. I highly doubt that will change, as they’re the WASR of footwear. Minor yearly maintenance is enough to keep them lasting a long time.